The University of Birmingham, British Gas and ALD Automotive are amongst the winners of this year’s Fleet Hero Awards, which focussed on air quality issues and reaching carbon emissions targets. 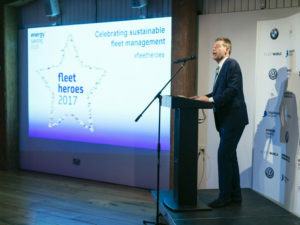 Run by the Energy Saving Trust and now in its 12th year, the annual Fleet Hero Awards applauded organisations leading the UK the way to reduce emissions from road transport. The awards ceremony, held in the Museum of London Docklands, was hosted by electric vehicle aficionado, Robert Llewellyn, and sponsored by the Department for Transport, BMW, Enterprise-Rent-a-Car, Highways England and Volkswagen. For the first time in the Awards’ history, the Unsung Hero award was shared between two – Matt Dale of Bristol’s ALD Automotive and David Hosking of Tusker. Philip Sellwood, Chief Executive of the Energy Saving Trust, said: “The entries were very competitive and it is very encouraging to see such a swell of new entrants this year.